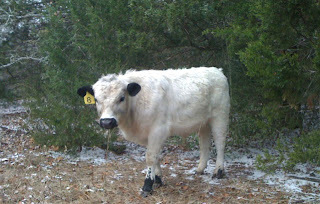 UPDATE 5/15/11: DOUGHBOY IS SOLD, See 'Bulls for Sale' page above for other British White bull prospects. J.West's Doughboy is now offered for sale due to unforeseen circumstances, please visit the bull sale page for current information on Doughboy. He is a fine herd bull looking for new pastures, he was trich and fertility tested on 4/25/11 and is offered for sale at a very reasonable $1400. See his May 2011 youtube video for the best look at this very desirable bull. Many parts of Texas saw a lot of frozen mornings and snowy days in February, which always makes for an interesting time with a cattle herd. 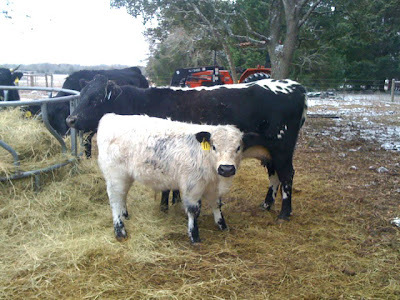 Valerie sent me photos of a few of her British White calves in February, and I thought I would update this blog with her latest pictures. They capture quite well the feel and sense of the cold days in Carmine, Texas in February, and you can almost smell the scent of clean crisp days. 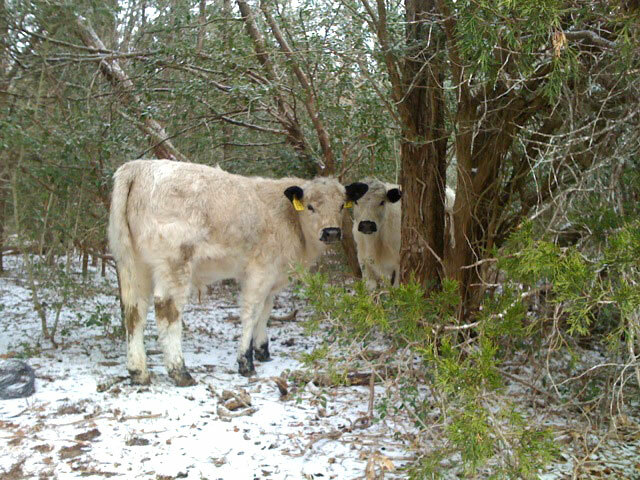 The thick coats of these calves attest to their ability to adapt to changing weather. It is an odd thing I’ve noticed, many British White calves born in the winter, particularly one that turns out to be rather harsh, seem to have a thicker coat at birth, or put one on in short order to protect themselves against the cold. Valerie and Patrick are working with the BWCAA breed up program, and this photo on the right is of J.West's Sweetie, hands down the best 50% British White cow I raised. Sweetie is a half sister to Bountiful 04 (see below), both sired by 'Doc' Watson, and her dam was an awesome registered black Angus cow. You would think there would be some black on her calves, but just get a look at this very pretty Doughboy sired 3/4 blood heifer she has raised this winter - absolutely a gorgeous heifer. This photo is of the same cow and calf pictured in my October blog, J.West's Bountiful 04, with a Doughboy sired calf. This meaty looking youngster appears to be growing off very well under the stewardship of Valerie and his dam, and just may have herd sire in his future - rather than grassfed beef for the supper table! 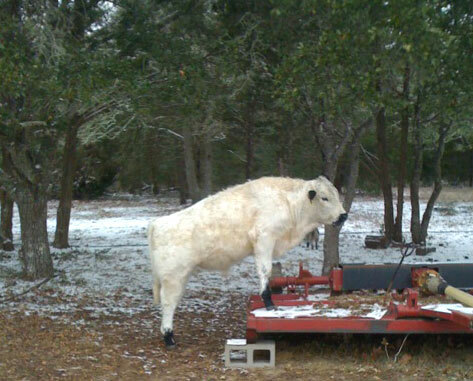 I am fairly sure that this meaty young bull qualifies as an American Fullblood British White, and I would not be concerned about his overmarked dam causing him to throw too much black. Bountiful 04's dam was actually about the highest selling bred cow in the big Halliburton auction several years ago, and her sire, 'Doc' Watson, produced many outstanding bulls still working today. And to add to that pedigree, I retain one of Bountiful 04's daughters, J.West's McQueenie, who is likewise overmarked, but she has given me nothing but incredibly beautiful standard marked heifer calves. 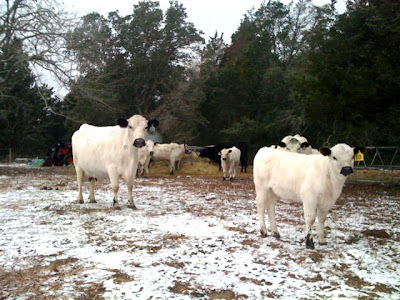 Doughboy's calves all look very thick and meaty, just what you want in the beef cattle business. Here are a couple more photos of their calves, and you'll note one of them appears to be ready for spring and some brush mowing of fresh grass! 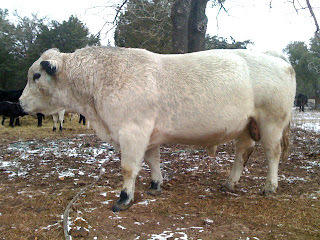 And here is a February photo of Doughboy, he packs a tremendous volume of muscle on his stocky long frame, and his calf crop attests to the fact that moderate framed bulls are more than capable of breeding standard frame commercial cattle - and improving them. Just click on the blog title link up above to view the October blog and photos referenced here. Update: May 2011 Video of Doughboy.